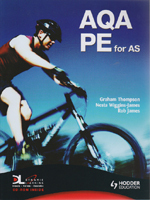 AQA PE for AS is an exciting and up-to-date text that provides all the essential knowledge and skills required by students to succeed in the new AQA specification for AS Physical Education. Written by an established team of experienced teachers, each chapter offers clear learning objectives, definitions of key terms, examples and practical applications, guidance on exam technique, exam-style and review questions, and helpful bulleted summaries. To aid understanding further, there is an accompanying student CD providing a highly portable electronic version of the printed text and interactive features such as mini-quizzes for self-testing. Also available to teachers is the invaluable Dynamic Learning Teacher Resource CD, giving teachers and their students additional support.